St. John’s Regional Fire Department Fire Chief Sherry Colford is pleased to announce the appointments of two new Deputy Chiefs - Deputy Chief of Operations and Deputy Chief of Support Services. Platoon Chief Rick Mackey will assume the role of Deputy Chief of Operations. Deputy Chief Mackey joined the Department in February 1987 and has served in several positions within the Department during his 31-year career, including Firefighter/EMT, Fire Lieutenant, Fire Captain and his recent position as Platoon Chief. He served on a number of specialty teams including High Angle Rescue, Confined Space and HazMat. He has completed studies in Fire Service Leadership and a certificate in Fire Service Administration and trained as a First Responder Instructor/Trainer. As head of the Operations Division, Deputy Chief Mackey will oversee fire suppression operations through the Department’s eight fire stations and complement of approximately 207 firefighters. Platoon Chief Robert Fowler will assume the role of Deputy Chief of Support Services. Deputy Chief Fowler joined the Department in June 1994 and has served in several positions during his 24 years with the Department, including Firefighter, Fire Lieutenant, Assistant Training Officer (Lieutenant) and Training Officer (Captain) and his recent role as Platoon Chief. He has completed courses in Public Sector Leadership and Management Development, Fire Service Leadership and holds a certificate in Fire Service Administration. He is also Co-Chair of the Occupational Health and Safety Committee. As Deputy Chief of Support Services, Deputy Chief Fowler will oversee 911 Communications, Fire Prevention and Training Division. 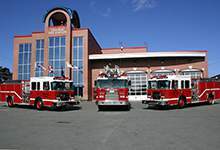 “Deputy Chief Mackey and Deputy Chief Fowler are proven leaders in our department and they each possess their own unique skills and experiences that will be valuable assets in bringing a positive and constructive culture of professionalism to the St. John’s Regional Fire Department”, says Chief Colford. Deputy Chief Mackey and Deputy Chief Fowler will assume their new roles effective Monday, October 1.